Pennsylvania is almost entirely covered with mountains, rolling hills, ridges, and plateaus, with rivers, canyons, and valleys in between. 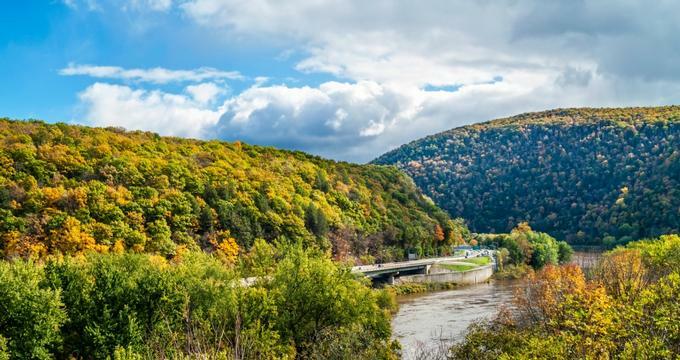 While the mountains do not reach the highs of their bigger cousins in the West, Pennsylvania is home to the Appalachian Mountains, which cut right through the state, with the Pocono and Allegheny Mountains as the most important sub-ranges. Located northwest of Allentown and about an hour and half’s drive from Philly, Bake Oven Knob is a 1,585-foot peak on the Blue Mountain rocky ridge in southeast Pennsylvania. The Appalachian Trail runs in this area and is your best option for hiking this interesting peak. The hike is fairly rocky with some scrambling, but large rocks on both sides of the trail offer fantastic vantage points to enjoy views of the Blue Mountain. 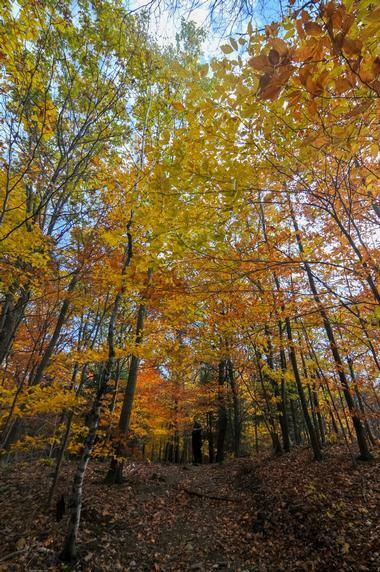 This popular hiking destination is especially interesting during the raptor migration in the fall, when you can also enjoy a flamboyant show of colors in the surrounding forests. 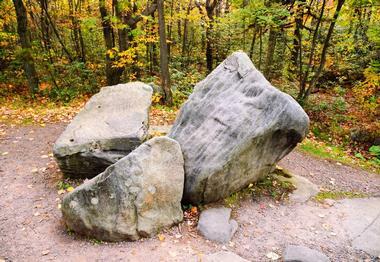 Beam Rocks is a 2,661-foot summit about 90 feet above the Laurel Highlands Trail. It is a short hike from the trailhead by the parking lot off the Laurel Summit Road. It offers beautiful views of the Laurel Ridge and Jennerstown. 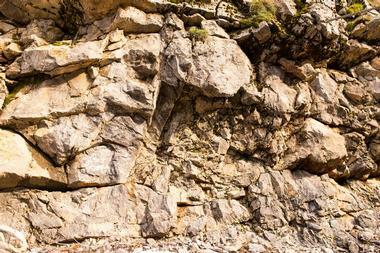 The rocks attract many local rock climbers, but if you are not into this sport, you can find a narrow passage between the rocks leading to caves that are worth exploring. This spot is popular, so do not expect any solitary enjoyment of nature. Be aware of the paths that end at sudden drop-offs. 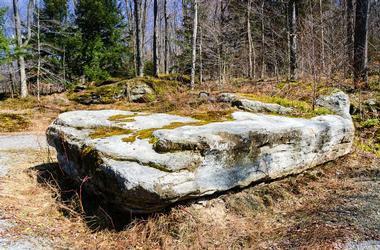 Wolf Rocks is a 2,639-foot-high massive sandstone outcropping on the edge of the popular Laurel Ridge summit. The trailhead for Wolf Rocks is in Laurel Summit State Park and from there it is an easy, pleasant 1.5-mile loop hike to Wolf Rocks. The area, just like the rest of the 70-mile-long ridge of Laurel Mountain, is densely forested and covered in fragrant mountain laurel. There are only a few overlooks in the Laurel Highlands that offer unobstructed views of the valley far below and Wolf Rock is one of them. Hikers can also enjoy watching hawks floating on the updrafts off the windy ridge, almost at eye level. 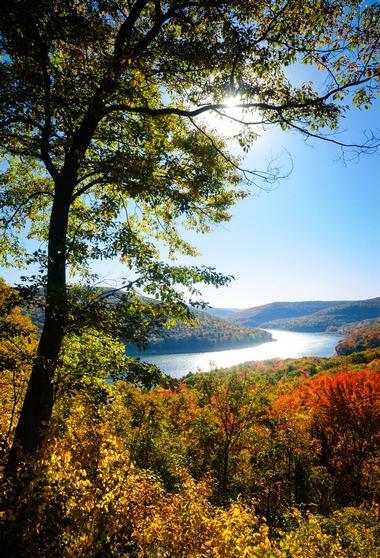 Gillespie Point is a 1,800-foot-high mountain above the town of Blackwell in the Tioga State Forest, offering fantastic views of Pine Creek Gorge. Because of its strange, almost pyramidal shape unusual in the state, locals call Gillespie Point the "Matterhorn of Pennsylvania." The hike to the Gillespie Point summit is 3.6 miles long, well defined and known as the northern end of the Pennsylvania Mid State Trail. The trail starts as moderately steep but goes up in a steady climb, crossing the face of the mountain without switchbacks. Once you reach the ridgeline, the hike gets easier and the views open up on both sides of the trail, especially in the fall and winter, when most of the leaves are gone. You can see far down into Pine Creek Gorge as well as the Pennsylvania Grand Canyon. Lewis Rocks is a 1,729-foot-tall popular scrambling and bouldering area in southern Pennsylvania. 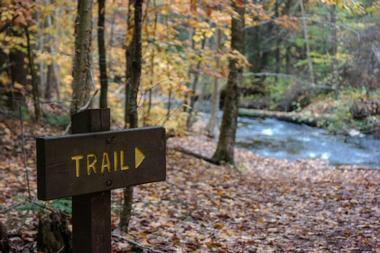 The trail to the rocks starts close to where the Tumbling Run and Mountain Creek trails meet. It is almost flat for the first 10 minutes. It runs through lovely ash and oak forests and dense bushes of fragrant mountain laurel. As you get higher, there are several trails that run parallel to Tumbling Run. Keep the stream always on your left as you go up and you will not go wrong whichever trail you choose. 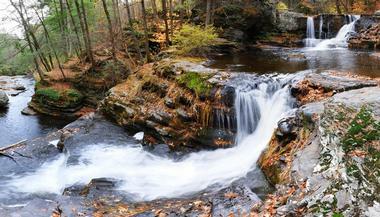 You will see a number of waterfalls and small pools along the way. The higher you go, the steeper and rockier the trail gets until you reach Lewis Falls. Follow the path to rocky formations on the ridge until you reach the summit. Spectacular views of the South Mountain will open up in front of you. The 2,133-foot high Camelback Mountain is part of the Big Pocono State Park in the Pocono Mountains, about 15 miles from the Delaware Water Gap. It is the highest mountain in the Poconos. The mountain is best known for the ski resort and waterpark on its northern slopes. It has about 7 miles of rocky trails to offer, with only one trail that starts from the base. Many people use the ski slopes to get up the mountain. The best trail is the 1.3-mile loop Indian Trail, which stretches from the summit to ledges along the shoulders of the mountain. 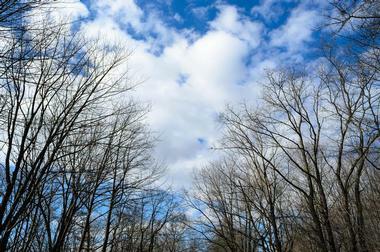 Hikers can enjoy great views of the Delaware Water Gap from this trail. Camelback Mountain is famous for the huge number of blueberry bushes that cover the higher mountain slopes. There are also some raspberries and wild strawberries when in season.?? Hemlock Mountain is a 2,080-foot-high mountain on the Northern Allegheny Plateau in northern Pennsylvania. It has steep, difficult slopes, and the trail runs along a stream to the plateau. You have to cross a ridge to finally go the last 300 feet all the way to the summit. Once on top, you have views on either side – rolling mountains near Pine Creek Gorge to the north, the Half Dome mountain to the south, and Pine Creek almost 1,300 feet below. There are several different routes up the mountain, but the main one is from the Black Forest Trail. 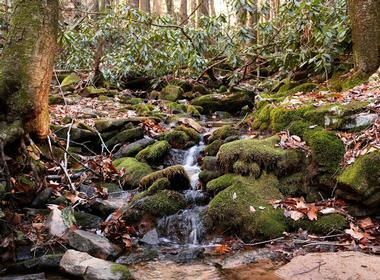 If you do not want to hike the entire 29.5 miles of this trail, you can take a cut-off trail from Forest Road or Big Trail Scenic Road. Rickard Mountain is a 1,637-foot-high mountain in the Bear Pond Mountains area that runs south to north in the Ridge and Valley System of the Appalachians. 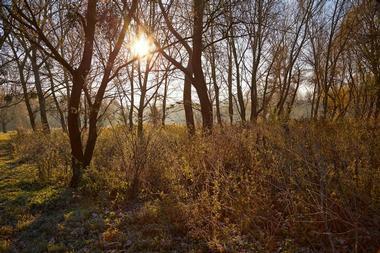 The southern side of the ridge starts near Blair's Valley Lake, where Blair's Valley and Polecat Hollow meet. The northern ridge end and the high point of Rickard Mountain is south of Kasies Knob and north of the Mason Dixon Line. Rickard does not have any maintained trails, and those trails that do exist are not marked, so hiking Rickards is pretty much a solid bushwhack whichever direction you take. There is a logging road that follows the ridgeline for almost the entire mountain. The summit does not offer any views, but there are some nice talus fields and ledges from which the views open to the west. Mount Nittany is a 2077-foot mountain located in State College, Pennsylvania, a few miles from Pennsylvania State University. The mountain is an important landmark for the town of State College and Penn State University, and even the football team is called the Nittany Lions. From the top of Mount Nittany you have a fantastic view of Happy Valley, which is the State College area. There is a 3 to 4-mile-long path that goes around the mountain. It is not used much and offers a pleasant, solitary hike. You will gain about a 700 feet in elevation right away, so expect a solid climb up the mountain. The path is well marked and maintained and there is a map at the trailhead. Follow the trail to the top, where the circle hike begins; just follow the white blazes and you will soon come across one of the main viewing places. The trail is a full circle, so you will not miss any of the lookouts.